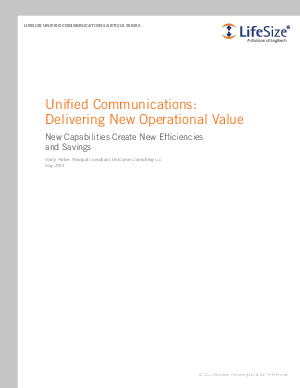 Based on proven market results, it is clear that Unified Communications, including the application of new, economical, and ubiquitous video capabilities, is delivering significant business process optimization value. UC is now a proven, fast growing, and compelling investment opportunity for most enterprises, of all sizes and across all industries. LifeSize recommend an investment of time to review your business or agency to find those places where video-based Unified Communications could provide breakthrough improvements in your operations. A consultation with qualified video solutions suppliers such as LifeSize is recommended as part of your review process. The payoff is likely to be rapid and significant.